Cancel all your plans people! The world is ending and this time it’s at the hands of zombies and giant helicopter-felling killer plants who don’t seem inclined to share the planet with those of us still living and non-botanical in nature. It’s all been brilliantly documented in this hilariously unnerving trailer for a fake movie – which I am must stress should totally become a real happening thing Hollywood! Anyone listening? 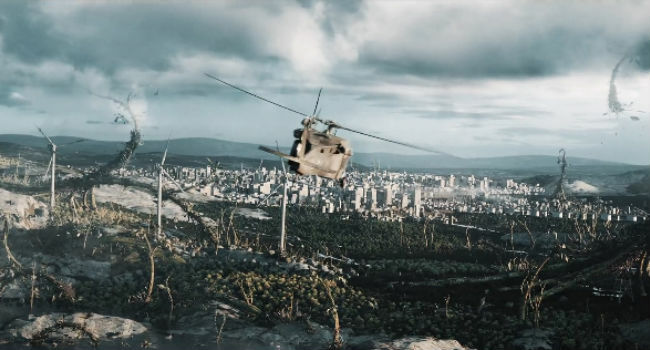 – for Dawn of the Planet of the Zombies and the Giant Killer Plants on Some Serious Acid by Norwegian self-described “3D generalist” Alf Lovvold, one of the partners in Gimpville, a visual effects house. The impressive thing is this gifted 3D artist managed to create this amazing mini-piece of cinema, one which postulates than there may be a lot more to fear from the end of social media than meal status updates, entirely by himself in his own time while balancing a day job and sundry other responsibilities. It honestly is a brilliant effort, a reminder, if we actually needed one, that true creativity is an organic thing that will not be denied and will find a way to express itself no matter how great the sacrifices needed to make it happen. You can find out more about how Lovvold, who often shortens the title, rather humourously, and appropriately for a parody film to Dawn of the..Stuff in a podcast he recorded with Allan McKay, and in the video that sits below the actual trailer that documents how this impressive piece of work came into being.